I went into Paul wanting to love it so much. 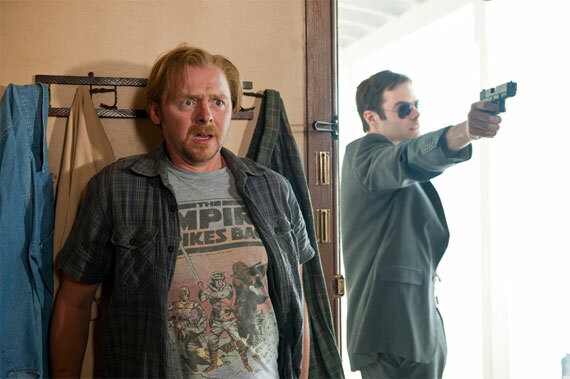 Previous Nick Frost/Simon Pegg collaborations Shaun of the Dead and Hot Fuzz are among my favorite movies of the last ten years and who doesn’t love Spaced? I also love director Greg Mottola (Superbad, Adventureland), a guy who has the ability to slide between raunchy and heartfelt emotion in the span of five minutes. Filmmakers like Mottola are increasingly rare—genuinely funny people with a touch of sensitivity who also know how to frame a shot. And I don’t hate Seth Rogen as much as everyone else, especially when I’m only dealing with his voice, so the alien Paul didn’t ever come to annoy me. Yet for all that, I didn’t leave the theater loving Paul as much as I wanted to. Don’t get me wrong—I liked it. There’s a lot to like about Paul. 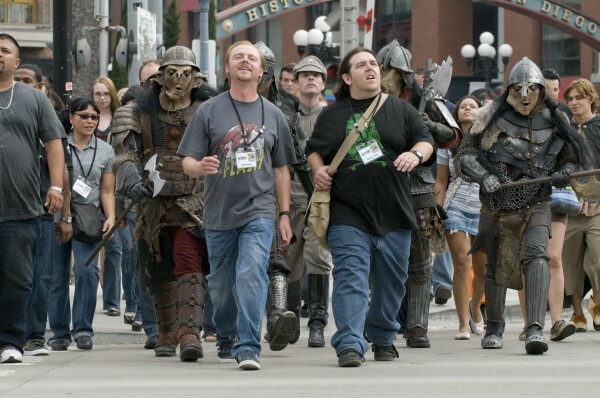 From the opening scene of Graeme (Pegg) and Clive (Frost) taking in Comic-Con with wide-eyed wonder Paul is ripe with sincere nerd fondness. This is not a movie that holds nerds and nerd culture up for ridicule or mockery. This is a love letter written with true devotion to its subject matter. 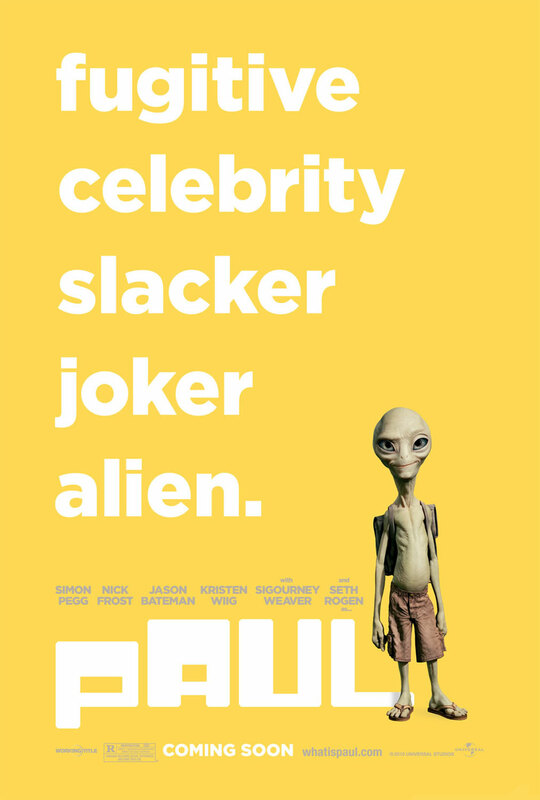 Paul is first and foremost a fanboy fantasy from top to bottom, from the geek-chic cast to the frames loaded with references from Star Wars, Indiana Jones, and Close Encounters of the Third Kind. I have never in my life felt so nerdy as when I recognized the Star Wars cantina band’s song playing in the background of a scene. Half the theater was laughing along with me, though, so I didn’t feel bad about it or anything. This is what Paul was meant to do—let us celebrate our inner nerds. The comedy is solid, too, for the most part. Pegg and Frost always work as a duo and they mesh into Mottola’s own sensibility well. Rogen’s vocal work is stellar and rivals Johnny Depp’s efforts in Rango. The CGI alien and Rogen’s voice come together to form a completely believable being. You totally buy that voice coming out of that creature and saying those words. Supporting players Jason Bateman, Bill Hader, Kristen Wiig, and Joe Lo Truglio (I Love You, Man, Pineapple Express) are all able comic actors, unfortunately, they’re not all handled equally. Hader and Wiig simply don’t have enough to do. Hader’s FBI agent should have played darker all along, more of a creepy backstabber, especially against Truglio’s nutjob agent. And poor Wiig is saddled with the worst dialogue and the lamest character—a backwards Jesus freak who “wakes up” courtesy Paul’s presence and begins swearing. Really? This is the best comic conceit we can develop for Kristen Wiig? Swearing? REALLY? Sigourney Weaver would have worked so much better had her presence in the film not been spoiled in the trailer. In contrast to Weaver’s anticlimactic appearance, Blythe Danner was a total surprise. She also had the best line in the movie, which in retrospect, OF COURSE that’s what she was doing. And John Carroll Lynch (Zodiac) is totally wasted. His character—Wiig’s Bible-thumping father—is useless. His one purpose, which does not involve any jokes, could have been served by any of the government types present at the climax. Paul simply had too many characters working out of balance, which is weird as one of Hot Fuzz’s strength is the balance of the ensemble against the central cast. As for the humor, it works 97% of the time. Very few jokes fell totally flat. Some played to certain segments of the audience better than others—Paul is loaded with sci-fi in-jokes—but overall everything went down well. 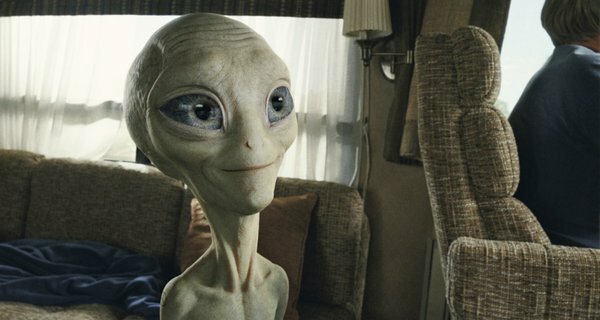 That in-ness is what will keep Paul from reaching a wider audience, but you don’t have to be a sci-fi buff to enjoy it. It featured plenty of gags you’d expect in a road trip comedy, too, like the ubiquitous hillbillies (David Koechner and Friday Night Light’s Jesse Plemons) who don’t really do much except play to the lowest common denominator. And that’s what bugged me about Paul. It’s not that the movie isn’t well made, because it is, and it’s not that it’s not funny, because it is that, too. It’s that it isn’t funny enough. With Pegg and Frost writing and Mottola directing, with this cast of these comedians and this plot—Paul should be the comedy to end all comedies. Like Pegg and Frost’s genre-bending collaborations before it, Paul should have been the apex of sci-fi humor. But it isn’t. It felt…a little lazy. A bit too lackadaisical. It lacked the edge of Shaun of the Dead and Hot Fuzz. The jokes, while solid, didn’t feel focused enough. Paul is a nerd love letter when it could have been a monument. But then you were all, “Jesse Plemons,” & it’s all my fangirl heart can take. LANDRY/Lance. On the big screen. Dude. I’m there.